There are currently 50 presentations in our Media Library. All presentations can be immediately downloaded for free below - no membership required. Choose one, or choose them all- and share them with your gardening friends. 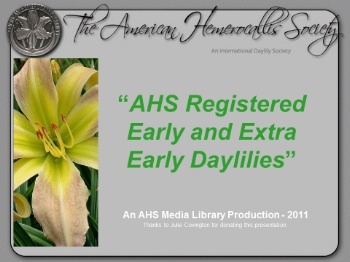 NOTE: The American Daylily Society has received the expressed consent or owns the copyright to materials provided below. All materials are copyright protected and may not be reproduced without permission. There are requests for presentations from clubs that we cannot fill. 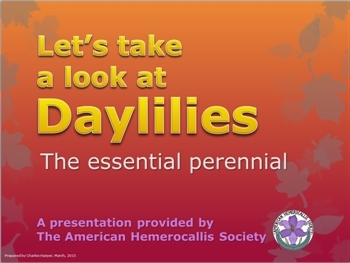 If you have done a presentation, we would love to help you share it with the daylily community! We hope you enjoy this compendium of the “best of the best” photos from the 2016 national and Region 2, 4, 5,13, 14 and 15 contests. 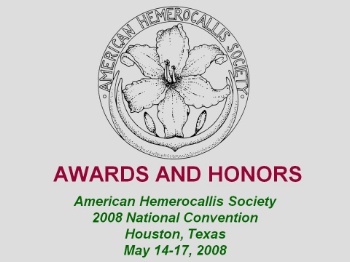 Each has won recognition in a judged contest. While each contest had its individual requirements, all shared a common goal of identifying the most outstanding among the entries. 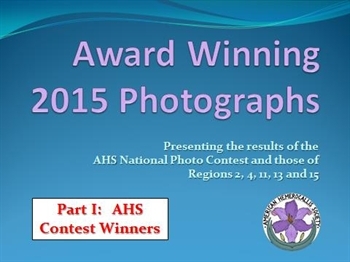 This package, PART I, presents the photographs from the national contest. 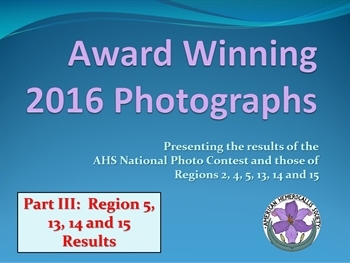 We hope you enjoy this compendium of the “best of the best” photos from the 2016 national and Regions 2, 4, 5,13, 14 and 15 contests. While each contest had its individual requirements, all shared a common goal of identifying the most outstanding among the entries. This package, PART II, presents the photographs from Regions 2 and 4. 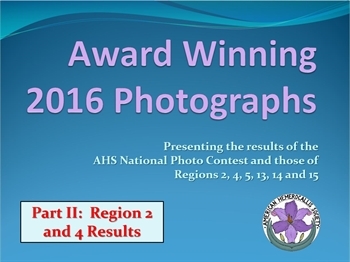 We hope you enjoy this compendium of the “best of the best” photos from the 2016 national and Regions 2, 4, 5,13, 14 and 15 contests. While each contest had its individual requirements, all shared a common goal of identifying the most outstanding among the entries. This package, PART III, presents the photographs from Regions 5, 13, 14 and 15. 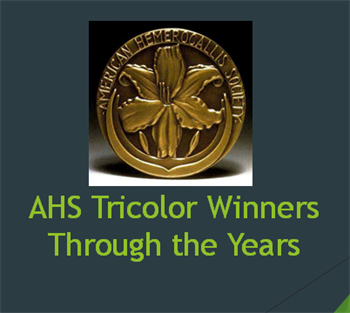 This PowerPoint Presentation contains photos of all Tri-Color Medal Awards since 1958. 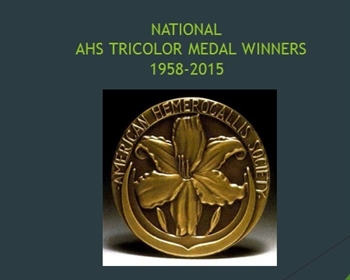 The Tri-Color Medal has been awarded by the American Daylily Society annually since that year. It was originally called the Mabel Yaste Tri-Color Medal. Each year a winner is chosen from among winners of local daylily show design divisions, following national rules. 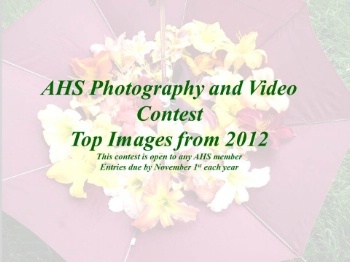 A photo of each winning entry is submitted and the national winner is chosen from among these photos. 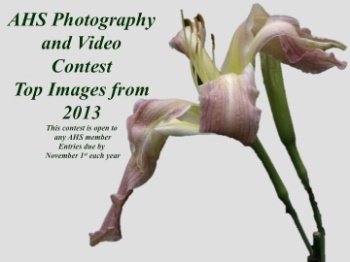 The winner is published annually in the Daylily Journal. All of these designs are Tricolor Winners at an accredited show. 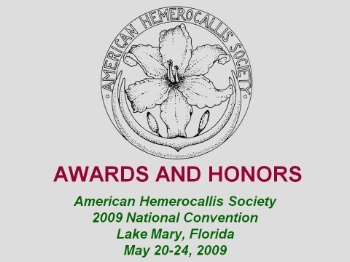 As such they have met the judging standards established by the National Council of State Garden Clubs. We hope that this slide show will provide an inspiration and give ideas for the design section of a show. Throughout the program, note the themes, containers, backgrounds and line materials. In all cases daylilies must dominate the designs. The first 74 photos were originally a slide presentation. The text is from notations on the slides and the slideshow script. 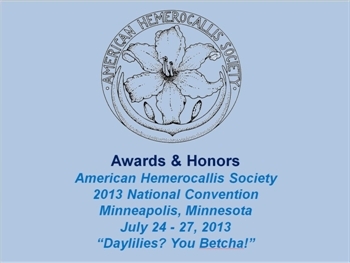 These slides include a variety of both local and national winners compiled and contributed by Nell Shimek. Organized into a PowerPoint by Patsy Cunningham in 2015. 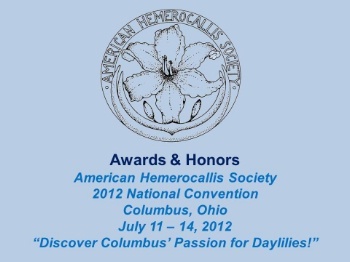 It is followed by additional recent local Tri-Color Award winners from Nell Shimek and other credited sources. Please review the requirements for competition as noted in the Exhibition Judges Handbook. 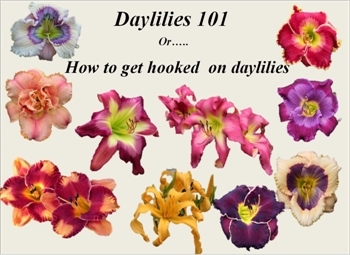 Daylilies 101 is a free presentation that you might want to use as a general audience introduction to daylilies. 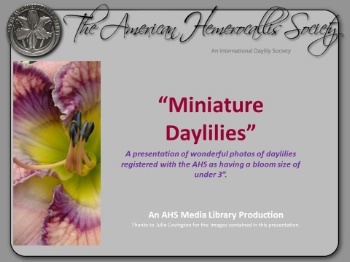 It has been prepared and donated to the Media Library by Julie Covington, former national president and daylily ambassador, who designed it for use with garden clubs, and similar groups. Revised and updated, this is an Introduction to the Daylily. 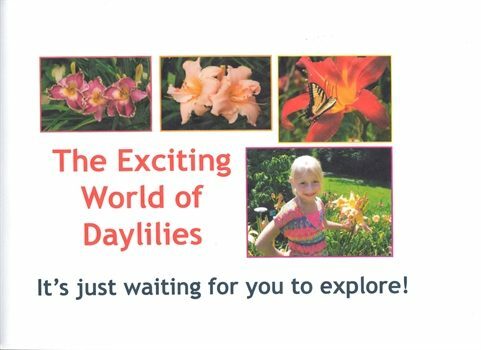 It has been designed for use in educational/informational presentations to daylily clubs, garden clubs, civic or other organizations interested in learning more about our favorite flower. Information is presented on the slides, to help guide you through the program. Most highlight key features about daylilies and their flowers that should keep your audience engaged. 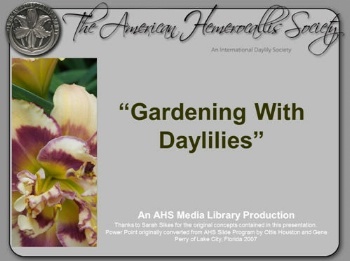 We are grateful to Doug McKemie and Sandy Perkins for giving us this program showing how they hybridize daylilies in their garden. 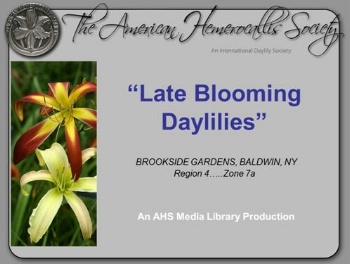 It’s a nice show for newcomers to daylilies or those wishing to try hybridizing. We hope you enjoy this compendium of the “best of the best” photos from the 2015 national and Regions 2, 4, 11, 13 and 15 contests. While each contest had its individual requirements, all shared a common goal of identifying the most outstanding among the entries. This package, PART I, presents the photographs from the national contest. We hope you enjoy this compendium of the “best of the best” photos from the 2015 national and Regions 2, 4, 11, 13 and 15 contests. While each contest had its individual requirements, all shared a common goal of identifying the most outstanding among the entries. 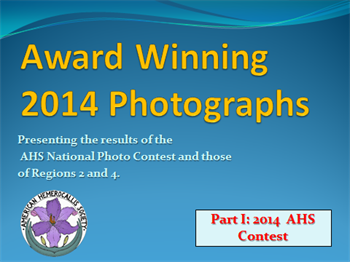 This package, PART II, presents the photographs from the Region 2 and 4 contests. We hope you enjoy this compendium of the “best of the best” photos from the 2015 national and Regions 2, 4, 11, 13 and 15 contests. While each contest had its individual requirements, all shared a common goal of identifying the most outstanding among the entries. 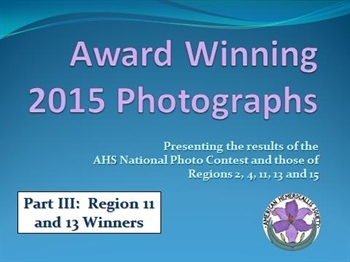 This package, PART III, presents the photographs from the Region 11 and 13 Contests. We hope you enjoy this compendium of the “best of the best” photos from the 2015 national and Regions 2, 4, 11, 13 and 15 contests. While each contest had its individual requirements, all shared a common goal of identifying the most outstanding among the entries. 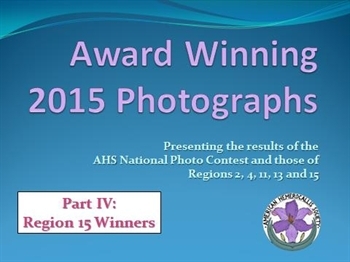 This package, PART IV, presents the photographs from the Region 15 Contest. 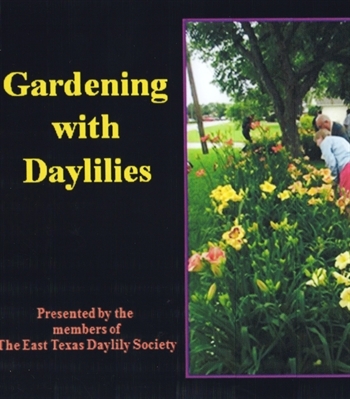 An overview of Daylilies for Youth Presentations. 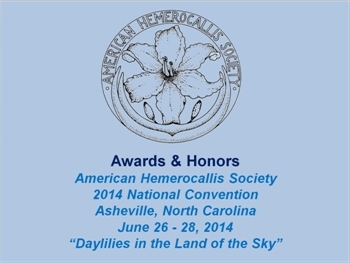 This is the presentation given to the attendees of the National Convention during the annual Awards Banquet. See a complete pictorial history of this year’s award winning daylilies. 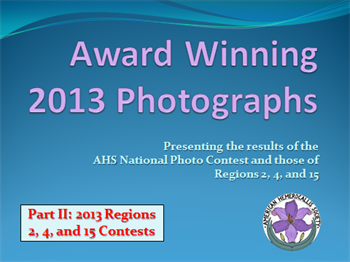 We hope you enjoy this compendium of the “best of the best” photos from the 2014 national and Regions 2 and 4 contests. While each contest had its individual requirements, all shared a common goal of identifying the most outstanding among the entries. This package, PART I, presents the photographs from the national contest. 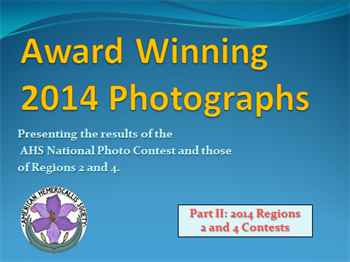 We hope you enjoy this compendium of the “best of the best” photos from the 2014 national and Regions 2 and 4 contests. While each contest had its individual requirements, all shared a common goal of identifying the most outstanding among the entries. This package, PART II, presents the photographs from the Region 2 and 4 contests. Get a new perspective on big color in miniature form as Julie Covington’s photos illustrate the diversity and necessity of miniature forms in the garden. We hope you enjoy this compendium of the “best of the best” photos from the 2013 national and Regions 2, 4, and 15 contests. While each contest had its individual requirements, all share a common goal of identifying the most outstanding among the entries. This package, PART I, presents the photographs from the national contest. We hope you enjoy this compendium of the “best of the best” photos from the 2013 national and Regions 2, 4, and 15 contests. While each contest had its individual requirements, all share a common goal of identifying the most outstanding among the entries. 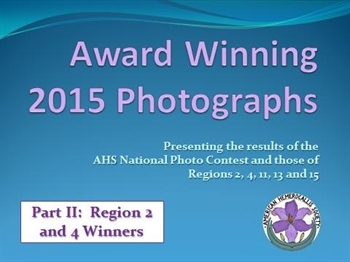 This package, PART II, presents the photographs from the Region 2, 4, and 15 contests. 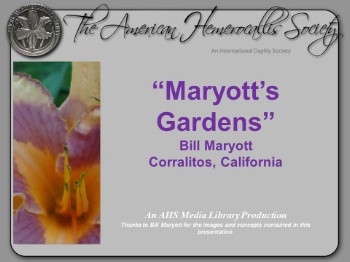 Affectionately titled, “How two old folks shipped 7000 daylilies,” this presentation is an in-depth look at the Maryott operation in California. Donated by the hybridizer, Bill Maryott. 115 wonderfully notated and photographed slides. Perfect for an interesting daylily club general meeting! Thank you to Bill for donating this presentation! This presentation features top images from the 2013 Photography Contest . Here’s your chance to view award winning photographic images in such categories as Landscape, Single blooms, Multi bloom, Youth photography and Artistic Images. Our first ever presentation in movie format! This presentation features top images from the 2012 Photography Contest . Here’s your chance to view award winning photographic images in such categories as Landscape, Single blooms, Multi bloom, Youth photography and Artistic Images. Contains images that received the highest scores from judges during the 2011 Photography and Video Contest – the “cream of the crop” from among the nearly 800 images submitted in 2011. 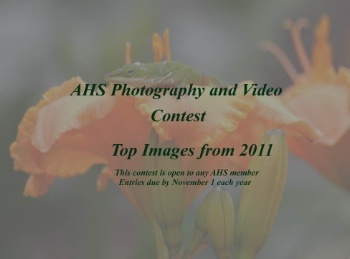 Those who are interested in participating in the contest can see what catches the judges eyes and get an idea about what constitutes award winning images. As an information point, all entries are sent to the judging panel with only an assigned number and the contest category included ( single bloom, multi bloom, artistic, etc.). This is an effort to make the judging process as equitable as possible for all contest entrants. An educational PowerPoint that provides an introduction into the exciting world of our newest recognized form, Sculpted. This presentation includes the official definitions, detailed explanations and over 50 spectacular images showcasing the unique shapes seen in the pleated, relief and cristate forms. A pictorial illustration of the hybridizing program at Daredevil Daylilies. 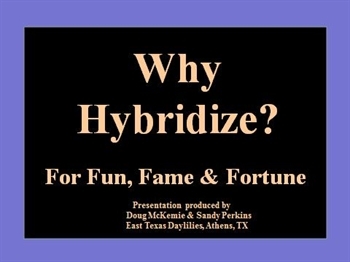 Donated by the hybridizer, Linda Michaels. Thank you to Linda for donating this presentation! 120 slides feature the most recent work of Jim and Margo. 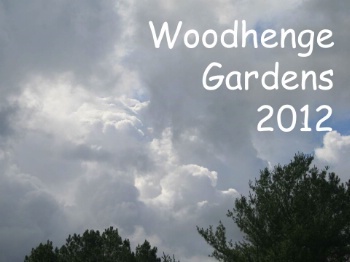 See stunning photos of their introductions and seedlings, as well as photos of their gorgeous property in Virginia. Thank you to Margo and Jim for donating this presentation! 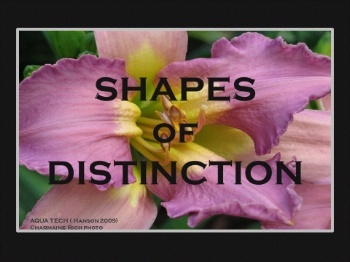 This presentation is filled with my photos that are meant to stimulate discussion, enthusiasm and encouragement around accredited Daylily Shows. It is also peppered with some educational information to get folks excited about doing a show. Just a bit of inspiration to get your club talking. And smiling. And having a good time bringing in new daylily fans. Thank you to Nikki Schmith for donating this presentation! 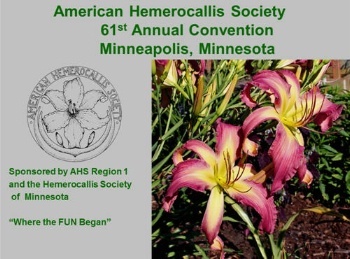 A wonderful photo show of the Minnesota gardens that were host to the 2007 attendees. Some of these gardens will be on tour at the National in 2013, so this is a great preview of and enticement to attend the National Convention in 2013. 221 slides, notated by photographer. 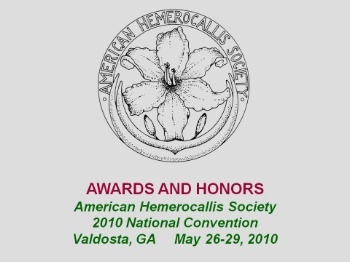 This would be a great program to show at a club meeting or at a general garden club function! Thank you to Chris! 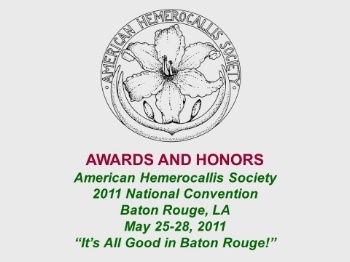 This is the presentation given to the attendees of the National Convention during the annual Awards Banquet. 107 slides converted from the original Sarah Sikes presentation of the same name. Includes award-winning garden etiquette slides. 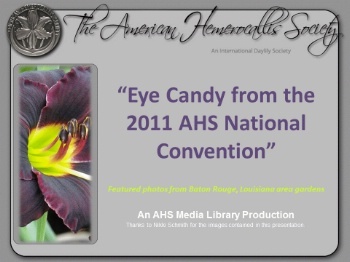 Donated by Nikki Schmith, this photographic journey features the National Convention held in Baton Rouge, Louisiana. 80 slides. Donated by Nikki Schmith, a photographic journey of Orlando area gardens featured on the national tour. Many macro-level photos of rain-kissed blooms are included. 53 slides and 115 photos. 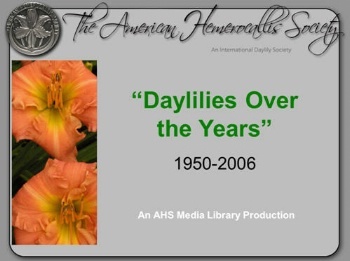 See a complete pictorial history of this year’s award winning daylilies. This presentation features all gardens from the 2007 National tour in Minneapolis, MN. Donated by Julie Covington. This is a tour of all the gardens from the 2006 National meeting on Long Island, NY. “Preparing to Exhibit Daylilies” donated by Nancy Falck. 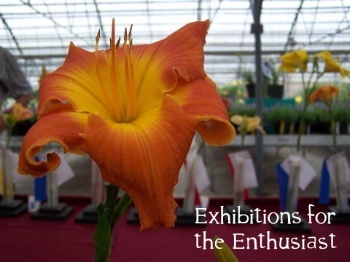 62 fully-illustrated slides containing tips to be a better daylily exhibitor. Grooming, transporting and selection tips included. Donated by Nancy Falck. 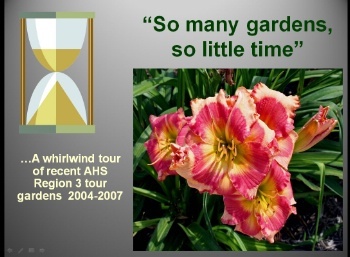 76 slides fully illustrating the ins and outs of putting on a daylily show. Helpful hints, tips and things to avoid are all included. Photos from all over of exhibition shows and methods included. Perfect for clubs thinking about hosting a show. Donated by Julie Covington, this presentation features 168 slides showcasing daylilies registered as early or extra-early. Early and Extra Early registered cultivars are those which garden visitors seldom see in bloom during National, Regional or local garden tours. These images represent only a small fraction of the 7,698 cultivars currently registered with the (at the end of 2010) as early or extra early bloomers! “Late Blooming Daylilies” donated by John Stahl. 29 slides. Includes photos of some real beauties for the late landscape. Nice presentation for spring to help buyers look for late bloomers. “Tall Daylilies” donated by John Stahl. 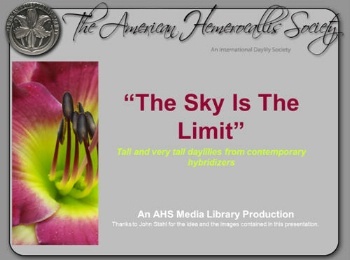 41 slides showing that “the sky is the limit” in daylilies. Donated in 2008, this program showcases many wonderful cultivars. Fully notated. Donated by John Stahl. 82 slides wonderfully notated. Great educational program. Donated by Nikki Schmith. 73 slides filled with great photos of the Madison, Wisconsin area gardens. People, gardens and cultivars shown. “Region 3 Tour Gardens 2004-07” donated by Julie Covington. 129 slides filled with color of these east coast gardens. Stunning photography takes the viewers on a wonderful tour, complete with garden and cultivar names.